Sister Mary Enid Lodding, BVM (Enid) died on Friday, July 27, 2018, at Stonehill Care Center in Dubuque. Visitation, Sharing of Memories and Mass of Christian Burial were on Wednesday, Aug. 1, 2018, in the Marian Hall Chapel. Burial was in the Mount Carmel Cemetery. Sister Mary Enid was born in Chicago on March 14, 1927, to Edward and Lillian Lenick Lodding. She entered the BVM congregation Sept. 8, 1944, from St. Joseph Parish, Chicago. She professed first vows on March 19, 1947, and final vows on Aug. 15, 1952. 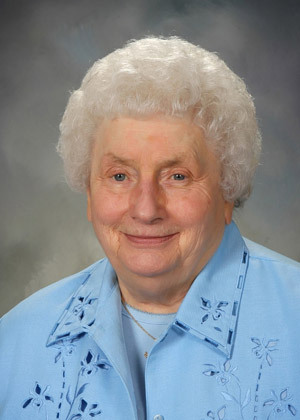 Sister Mary Enid was an elementary teacher in Illinois at St. Agatha in Chicago, Sacred Heart in Rock Island, and St. Anne in East Moline, and in Iowa at St. Mathias in Muscatine, St. Paul in Davenport, and St. Mary in Iowa City. She also taught at Our Lady of Perpetual Help in Chattanooga, Tenn.; St. John in Seattle, Wash.; and Queen of Peace in Portland, Ore. She was a pastoral minister at the Catholic Student Center and pastoral associate and director of religious education at St. Thomas More Parish, both in Iowa City, Iowa; pastoral associate at Our Lady of the Wayside in Arlington Heights, Ill; and director of religious education at St. Philip the Apostle in Addison, Ill.
She was preceded in death by her parents and sisters Lillian Kissane and Loretta Cassidy. She is survived by nieces and nephews and the Sisters of Charity, BVM, with whom she shared life for 73 years. Memorials may be given to Sisters of Charity, BVM Support Fund, 1100 Carmel Drive, Dubuque, IA 52003 or make an online gift. Visit our online streaming service to tune in to live videostreams or view past services. Receive notifications of new obituaries in your inbox. FREED BY LOVE, ACTING FOR JUSTICE. Founded in Philadelphia, Pa., in 1833 by Mary Frances Clarke, with our roots tracing back to Dublin, Ireland, we are the Sisters of Charity of the Blessed Virgin Mary. Copyright 2018 - Sisters of Charity of the Blessed Virgin Mary. All Rights Reserved.